Enchiladas are always good. But with most things, I almost always enjoy a white sauce version over red. So the classic enchilada you will not find here on my blog, but a few variations are quickly becoming favorites (see white chicken enchiladas—yum!). This is a sweet version that is a great twist with delicious chicken marinated in a sweet lime sauce. So cheesy and, as with most hispanic foods, gets better as leftovers which is great since this was almost a whole week worth of dinners for my hubby and me. 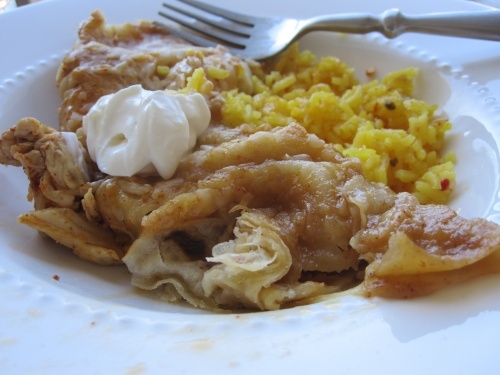 Serve with some yellow rice and a dollop of sour cream. Sweet with a little kick. Preheat oven to 350 degrees F. Place the cooked and shredded chicken in a medium sized bowl. Set aside. In a small bowl, place the honey, lime juice, chili powder and minced garlic or garlic powder. Whisk together thoroughly to combine. Pour this mixture over the chicken and cover with plastic wrap. Allow to marinate while you prepare the tortillas, 30 minutes or up to 1 hour, in the refrigerator. Heat a large griddle till a drop of water skitters across (about 350 degrees F). Spray the surface with non-stick cooking spray or a oil it with a little bit of canola oil in between each round of tortillas. Heat tortillas about 20 seconds on each side till warm and ﬂexible and some golden brown spots have appeared. Remove the tortillas from the griddle and keep them between a couple of paper towels until ready to use. Spray the sides and bottom of a 9×13-inch baking dish lightly with cooking spray. In a medium bowl combine the enchilada sauce and the heavy cream. Spread about 1/2 cup of the mixture in the bottom of the oiled baking dish. Add a large spoonful (about 2 tablespoons) of the chicken mixture to the center of each tortilla in a line. Cover the chicken with a large tablespoon (or big pinch) of cheese, then roll the tortilla up from one side to make a rolled enchilada – it will be more of an over lap on the seam side that rolled tightly. Place the enchilada seam side down in the baking dish starting at one end with the long edge parallel to the longest side of the pan so that you end up with two columns of 4-5 enchiladas each (go with what you can fit in your dish). Repeat with the remaining chicken, cheese and tortillas. You will use about 1 1/2 cups of the cheese for the ﬁlling and set the remainder aside for topping the enchiladas in the pan. Add the remaining marinade mixture to the enchilada sauce and cream mixture, if desired. Pour this mixture over the top of all the enchiladas. Sprinkle with the remaining cheese. Bake the enchiladas for 30 to 35 minutes, until the cheese is melted and bubbly and starting to brown on top.